Home Column PowerShell SharePoint SharePoint 2010 SharePoint 2013 SharePoint 2016 How to Remove a Column from SharePoint List using PowerShell? How to Remove a Column from SharePoint List using PowerShell? Requirement: User created a calculated column with error in its formula! That caused the list view web part to crash! 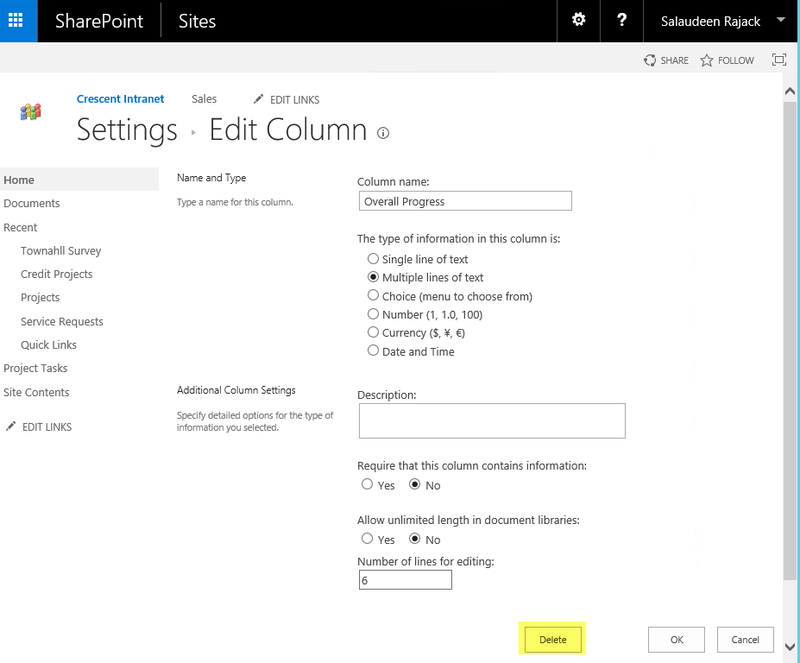 couldn't remove the column from SharePoint list using web UI. How to delete a Column from SharePoint List? Browse to the List or Library in which you want to remove column. click on List or Library tab. Click on List Settings / Library Settings from the Ribbon. From the List Settings page, Under Columns section, click on the name of the column that you wish to delete. Scroll down to the bottom and then click on "Delete" button. Confirm the prompt. Here is the PowerShell to remove a column from list. To make it reusable, lets wrap the code inside a function and call, to bulk delete columns from SharePoint list. In some cases, instead of "$Column.Hidden=$False", You may have to set: "$column.Sealed = $false"
Thanks, works very fine! Nice script.